Add beauty and value to your home with an entrance that makes a grand statement of quality and craftsmanship. For years, architects have used dramatic entryways and doorways to make a great first impression or to invite the beauty of the outdoors in. Now, you can choose from our impressive selection of premium quality Fiberglass Doors or our classic and beautiful Wood-Clad Entry Doors for a truly state-of-the-art, beautiful and functional entryway in your home. The strength of fiberglass protects your investment from the harsher side of Mother Nature. Our fiberglass doors won't crack, peel, warp, split or pit in any way. They're even paintable to suit your custom color taste! The strength of fiberglass protects your home from the sun, salt and humidity. 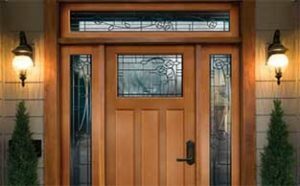 Our fiberglass doors won't crack, peel, warp, split or pit in any way. They are even paintable to suit your custom color taste! Example of Premium Wood Clad Entry Doors Manufactured by Simpson Door Company.